“What Pet Should I Get?” the new Dr. Seuss book, is an unpublished manuscript found in Seuss’s notes, and is set for release in July 2015. 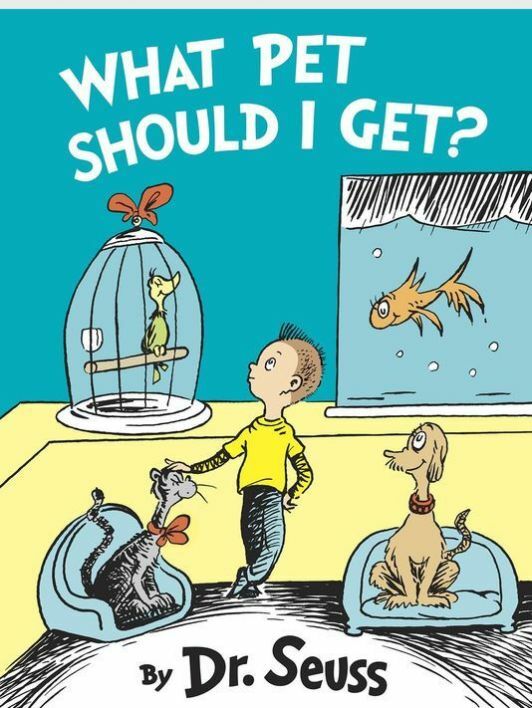 What Pet Should I Get?, a new Dr. Seuss book, whose manuscript was discovered by Dr. Seuss’ – Theodor Seuss Geisel – widow Audrey and longtime friend and secretary Claudia Prescott whilst cleaning the author’s office in 2013. The new manuscript and accompanying original illustrations are set for publishing by Random House Children’s Book in July 2015. What Pet Should I Get? features the same sibling duo from One Fish, Two Fish, Red Fish, Blue Fish – published in 1960. Cathy Goldsmith is Random House’s associate publishing director; Goldsmith estimates Seuss was penning the new book between 1958 and 1962. But there’s more, much more, in fact. The complete manuscript was only one among many other notes and drawings rediscovered. Random House is already predicting two more “new” Dr. Seuss books to be released from the find. What Pet Should I Get? will hit the shelves in July of this year. Read more about Dr. Seuss and the his latest book at USA Today. Related Topics:Audrey GeiselDr. SeussKristen E. StrubbergNew Dr. Seuss bookNew manuscriptNewsRandom House PublishingTheodor Seuss GeiselWhat Pet Should I Get?